The UK’s decision to leave the EU will have wide-ranging political and economic impacts in the UK. Brexit will result in dramatic changes to the way the UK is governed and how its public policy is developed. A key feature of the post- Brexit political landscape will be the return of trade policy to UK Government competence. This means that for the first time in 40 years, the UK Government will be directly responsible for developing an independent trade strategy and will need to establish new trading arrangements with partner countries across the world. This briefing explains the current level of democratic oversight over trade policy, and the process for treaty scrutiny which will be automatically adopted after the UK leaves the UK. 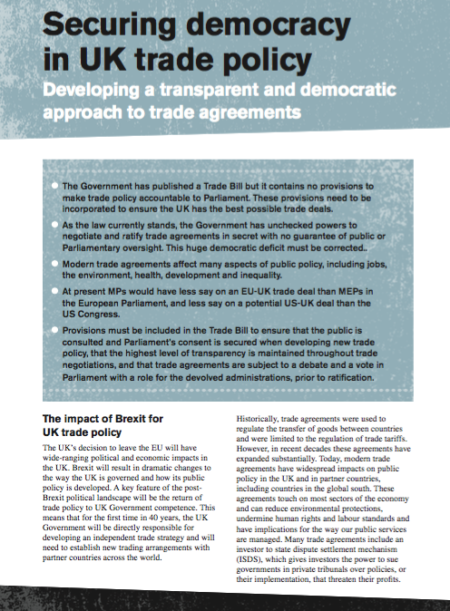 The briefing argues that the current process fails to deliver appropriate democratic oversight of trade policy, resulting in a democratic deficit, with Parliament and civil society mostly excluded. Through comparing the UK's processes to those in other countries, the briefing argues that there is an opportunity to give Parliament robust powers over trade policy and formalise a role for civil society. The increasing breadth of modern trade arrangements, combined with the implications of Brexit, mean that reform is urgently needed.